On Monday afternoon the Associated Press released their NCAA men’s basketball poll for week four of the 2018-29 season. After winning their first six games of the season, the Maryland Terrapins find themselves ranked No. 24 in the nation. This is the first time since February of 2017 that the Terps have been in the AP top-25. This early emergence in the top-25 may come as a surprise considering what happened in the offseason. Mark Turgeon was able to recruit another strong class but losing starters like Kevin Huerter and Justin Jackson to the NBA draft was a huge loss. Even after retaining key players like Anthony Cowan and Bruno Fernando, voters and media personalities struggled to pin down Maryland. Some had them finishing toward the top of the conference while others failed to see how they could build any momentum with such a young core. However, it appears many are starting to become convinced that this young Terps squad can make some noise this year. Having Maryland in the top 25 will also be great for the upcoming ACC / Big Ten challenge as the Terps prepare to host Virginia on Wednesday November 28. The Cavaliers are currently ranked No. 4 in the AP poll and are coming off the heels of a nice 53-46 win over No. 25 Wisconsin. This Wednesday’s nationally televised game will surely be a good one as Virginia receives their first big road test and the Terps will get their first chance for a resume win. The importance of this matchup cannot be stressed enough. The Big Ten currently has seven teams in the AP top-25 but Maryland may only get the chance to host a ranked team one or two more times this season. The last time these two teams met was in December of 2014. The Terps knocked off the Cavilers in their final ACC home game earlier that year but Virginia would get it’s revenge on Maryland by taking them down in the ACC / Big Ten challenge. Almost four years later, there is still no love lost between these former conference foes. Coming off of an embarrassing loss to Michigan on senior day, the Maryland Terrapins were tasked with winning four games in four consecutive days if they wanted to make it back to the NCAA tournament for the fourth year in a row. As the #9 seed in the Big Ten, Maryland was set to face off against Wisconsin on Thursday. When these teams met earlier in the year, the Terps were able to walk away with a 68-63 win. The Terps looked to do the same on Thursday afternoon at Madison Square Garden. Mark Turgeon’s team played with a lot of energy and speed for almost the entire forty minutes but in the end, the Badgers picked up the crucial baskets in crunch time to secure a 59-54 win and a date with Michigan State on Friday. Depth concerns have circled around Maryland for months now. In that time, a lot of close games have been lost by the Terps and changes clearly needed to be made if they were going to turn things around. The teams scoring leaders, Anthony Cowan and Kevin Huerter, helped with this by stepping out of the spotlight in a few games down the stretch. However, with their season on the line, the two knew they had to show up on Thursday in order to get the Terps into the next round. Cowan and Huerter jump started the Terps offense by being involved in the teams first 16 points. Through the first 12 minutes of play, the sophomore duo either scored or assisted every Maryland basket. As the game continued the two would not shy away from their leadership roles. Cowan scored 16 and was dominate in transition, helping to keep the Terps on pace with the Badgers. Huerter led the team with 20 points while shooting 8-15 from the field. To give you an idea of what kind of game this was, consider this. Both teams combined to make just five three pointers in the entire game but didn’t seem too concerned with that. Transition play and rebounding were the real keys to each teams success. As expected, Ethan Happ gave Maryland some trouble under the basket. The junior forward led the Badgers with 14 points and seven rebounds. After holding a 28-26 advantage at halftime, the Badgers were able to hold on to their lead by getting to the foul line. Wisconsin went 20-24 at the line while the Terps only had nine opportunities for free points. Throw in a 12-7 turnover disadvantage and you can see what led to the Terps downfall. Despite this, Maryland was right in the game right up until the final seconds expired off the clock. With under 10 seconds to play, Huerter tried driving to the rim for the tying score but ended up getting fouled in the process. The Terps needed him to sink two but an extended stoppage in play before the shot attempts seemed to bother Huerter as he missed the front half of the free throws. The Badgers spent a lot of time changing player positions in the paint prior to the free throw attempts and the refs allowed them to do so while Huerter was forced to stand their and wait. Before taking the first shot, cameras showed the sophomore clapping and asking the ref for the ball with a frustrated look on his face. After this miss, the Badgers were able to sink their free throws and take a three-point lead before forcing a turnover and putting the game on ice. This marks the fourth time in the past eight years that the Terps have missed the NCAA tournament. They have also only made the NIT once under Mark Turgeon. Their future is still up in the air after failing to finish above .500 in conference play and then making an early exit from the Big Ten tourney. We will be here for any potential games left this season for the Maryland Terrapins. Thank you for reading and following the team with us. Lets hope for a more exciting and injury free season in 2018-19. It was not pretty and the second half certainly wasn’t clean, but in the end the Maryland Terrapins pulled out their second road win of the season by taking down Northwestern 71-64. With these two teams meeting just nine days ago, there was some familiarity when they stepped on the court Monday night. The Wildcats were coming off of a devastating loss to Michigan State in which they lead the Spartans by 27 but still managed to lose 65-60. Maryland, on the other hand, has enjoyed a decent amount of success in recent games while winning three of their last five. The Terrapins shot over 50% from the field in Monday’s win over Northwestern but got a great deal of offensive production from some players who usually remain quiet. Michael Cekovsky has not started much since returning from injury but still provides the team with a nice boost off of the bench. It’s not often that Maryland has an advantage under the basket but Cekovsky didn’t waste anytime using that to his benefit when he came off the bench in the first half. The 7-foot-6-inch senior dominated the rim with three dunks and four rebounds in the first half. Dion Wiley also came through with one of his more flashy performances of the year. Mark Turgeon has given Wiley an opportunity to start a lot of games over the past few weeks but he has stuck to his role as a facilitator for the most part. On Monday, the junior from Oxon Hill dropped 13 while adding three rebounds and a pair of steals. Kevin Huerter would finish with 18 points and four assists to lead the Maryland offense. He was also responsible for three of the Terrapins five three pointers in the game. It was interesting to see Maryland shy away from the deep shots especially in the first half when the Wildcats were flourishing from beyond the arc. Chris Collins’ team shot 15 three pointers in the first half and managed to sink eight of them to take a 37-30 lead at the break. However, that previously mentioned height difference between each teams big men helped the Terps keep pace with Northwestern early and eventually pull away. I am also a little surprised with just how fast the Terps played at points, especially in the second half. With the regular season coming to a close, I would have guessed that most of the team would be drained from playing extended minutes all year. Instead, Maryland did a lot of their scoring in transition and appeared to fluster the Wildcats down the stretch. Maryland’s 41 point second half was fun to watch mainly because of their consistency. There were no scoring droughts as the Terps spent the full 20 minuets battling to either get even or hold on to a slim lead. Just like their game against Rutgers on Saturday, Maryland did a good job of closing the game out with a lead as well. Northwestern started intentionally fouling a little earlier than expected and the Terrapins took advantage by going 6-6 from the line to put the game on ice. This second road win has been a long time coming for the Terps. There have been a lot of close calls since they took down Illinois in overtime earlier this season but they could never quiet get it done. I was happy to see Maryland thrive away from home but I can’t help but think about Northwestern’s arena situation. The Wildcats have been relocated to the Allstate Arena this season while their normal home gets renovated. 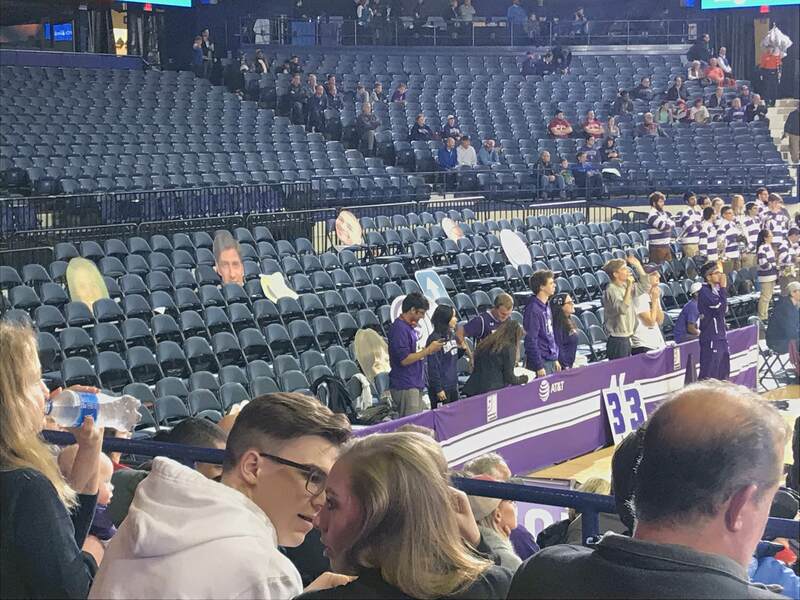 This has resulted in a lack of home court advantage for Northwestern. Just look at this picture of their student section from tonight’s game. None the less, the Terps found a win outside of the Xfinity Center and that all that matters. Maryland will honor their senior players this Saturday as Michigan makes a trip to College Park. Big wins have eluded the Terps all season but they will get one more crack at it as the Wolverines are currently sitting at No. 17 in the AP rankings.